We are offering 10% commission. Samples, brochures and other relevant marketing information will be provided. Easy to learn product training will be presented. Exclusive territories and ongoing support. 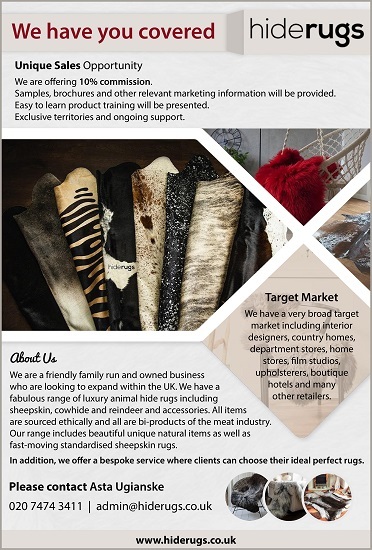 We have a very broad target market including interior designers, country homes, department stores, home stores, film studios, upholsterers, boutique hotels and many other retailers. We are a friendly family run and owned business who are looking to expand within the UK. We have a fabulous range of luxury animal hide rugs including sheepskin, cowhide and reindeer and accessories. All items are sourced ethically and all are bi-products of the meat industry. Our range includes beautiful unique natural items as well as fast-moving standardised sheepskin rugs. In addition, we offer a bespoke service where clients can choose their ideal perfect rugs.